Any calf that doesn’t drink its milk, is scouring, or looks a little thirsty gets a bottle of electrolytes. The subtitle of this blog has always been my family’s motto. Our farm maintains an airtight protocol when it comes to our calves, and using electrolytes as both a treatment and proactive measure is a major tool for us. Starting with our youngest calves (1 to 3 days old), we esophageal tube feed them electrolytes if they drink less than half a bottle of milk (two quarts). What we have noticed in a few of our newborns is that they get constipated from the colostrum, and sometimes tubing some extra fluids can help move things along. Calves that are older and are continuously drinking on their own have a different protocol. If these calves don’t drink all their milk, we will feed them electrolytes. We have come to the conclusion that if they leave any amount of milk, there is probably something wrong. After a second look, we may find these calves have scours or pneumonia. Electrolytes will rehydrate them and give them extra fluids to improve their appetites. If we have a calf that is severely dehydrated, we will tube feed electrolytes to them three times a day. Along with this, we continue to bottle feed milk and provide fresh water. Remember, electrolytes are not a substitute for water or milk; they are an addition to the calf’s diet. We also feed electrolytes to calves that drink a whole bottle of milk but are still thirsty or overly rambunctious. Extra electrolytes also go to calves that get out of their hutches and have been chased around the farm. Some calves just need a little something to drink extra now and then, and we bottle feed these instead of tubing them. A good time to feed extra electrolytes is during extremely cold or hot weather. It can be proactive for your calves’ health and give a boost of energy they may need. Lastly, both my parents have told me the most important part of electrolytes is the water. 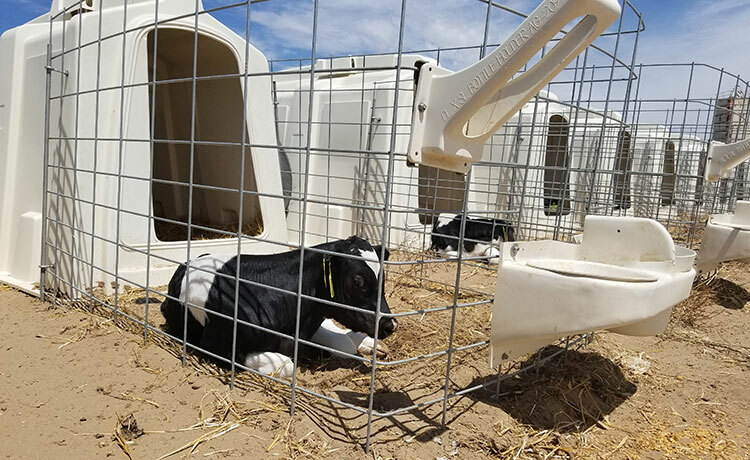 Whether calves are scouring or have pneumonia, they are losing more fluids than normal through their feces or from an increased respiratory rate. Furthermore, be sure to consult with your veterinarian for product information to find an electrolyte that will work well in your calf protocol.